I think it's also a bit of watching their parents talking into the thing and realizing that it must be quite important. 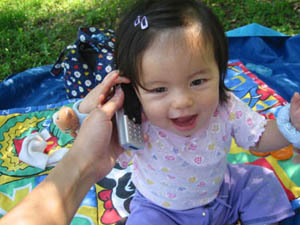 Our 1 year-old isn't so much soothed by the phone as perplexed by it. We tried buying a kiddie version of a mobile, and after pushing the buttons for 10 seconds, he tossed it aside and pointed back at mine. He shoves it at his mouth with a monotone growl, not to eat it, but because he's trying in his way to mimic our act of talking. Probably a version of his current developmental stage, but if we weren't talking into it I know he wouldn't care much about it. What is it that makes the mobile such an interesting, important, perplexing object versus the other objects he sees you using every day? Why do they seem more eager to talk to/through an object than to other people? What type of importance does our behavior invest the phone with? Couldn't agree more. My niece won't even look at her toy phones. Love the name of your blog ! Or like when your cat walks over your keyboard as you type. Being a mother myself and having to handle the Sony Ericsson everytime the thing is at sight's distance of the baby, please sign me up to the list of people who really need to understand this one soon...she's broken two phones already and now, she does not like the old broken one(which I innocently tried to handle instead of the useful, office-paid one).